Breaking Deadlock – "And another thing…"
I was going to put my thoughts throughout you latest message and then decided not to. I was sick over all this homosexual stuff and have come to the conclusion that it maters not. The church and the people will only do what they want and maters not how I feel or see things. If the homos and the supporters want to have this than go a head. I don’t want my name affiliated with said church. I told many in leadership that this was going to split the church worse than it did over women it the priesthood and it is. Churches are closing and people are being displaced, leaving the CofC going underground and will wait for the truth to come forth as it did in the reorganization in 1860. I want out so bad but the Lord has not called me to leave yet, I have to wait. I will not be quiet though. The doctrine of faithful disagreement is only a gag order and will not work. People who I speak to are upset and not angry, hurt and yet want to stay true to the 1830/1860 church. we do not have to go along and change with the times. We need to stand firm and hold on to the rod of iron. You mentioned that this is still the same church well it isn’t to me and when asked what church I belong to I am ashamed and embarrassed to say CofC I say Reorganized Church of Jesus Christ of Later Day Saints. This is the church I joined not the CofC I do not recognize it at all. I want to send a resolution to the church that I am a supporter of polygamy and want to see a new policy change, I don’t see the problem with polygamy and it is legal in some places in the world. on this issue. not really but someone will. Well you have a lot to say and I understand where you are coming from I disagee with a few things like staying. In all the changes ever made this one goes against the Lord. My salvation and eternal life is important to me. I have to guard them from man, for I serve God, His Son Jesus Christ and the Holy Ghost. Hi Linda, thanks for your comments. I understand that you and many others are really hurting. It is largely because of that fact, that so many conservative church members are hurting, that I have sought to discern if there is a solution and/or something that we have overlooked, and for me, the answer to that question is yes, and of course, that is the gist of this blog, and my ZionBound series. I can only accept these changes because I believe that God has made it ok. But in the past, I believe it was against his will. Dave, Sorry, I cannot accept these changes and will not. I believe God has not made it okay. It is against His will for He changes not. You my Brother may be very well read and a learned man and I appreciate that in you. I am not a schooled in that way but I have read studied and taken many classed, also read the very same books. I see no right. I do how ever LOVE all persons. But will not follow what I preserve as going against the WORD OF GOD. Hi Linda, I appreciate your point-of-view. We are blessed that one of the founding principles of our church is free agency, so we remain free to have the opinions that we do. I’m not sure I’d agree that I’m well read or learned. Far from it, but I’ll take the compliment and appreciate your kind words. You said that God does not change, and if I were Catholic, or Protestant, I would agree with you. 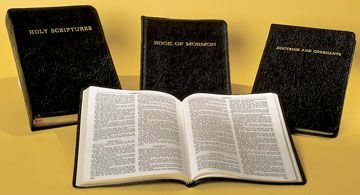 However, it is because of my faith in the Restoration, especially in the Book of Mormon and the Inspired Version, that I am now convinced, from having done a bit of an exploration in those books, that God does change. This is the testimony of the Restored Church, and it has always been so, we have however never realized it before, but its all right there in our standard of authority, and always has been.